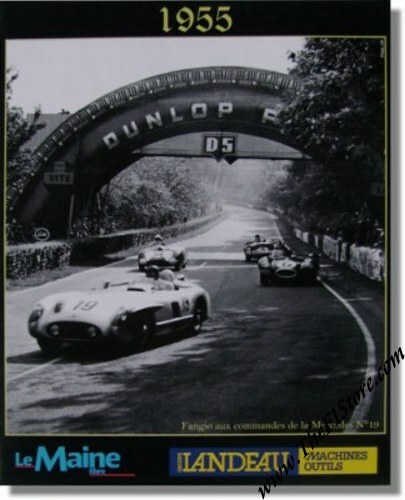 Issued by Le Maine Libre, a local Le Mans newspaper, in 2006 it shows Grand Master Juan Manuel Fangio at the wheel of the # 19 Mercedes-Benz 3002 SLR (S/N 0007/55) while being chased by the # 6 Jaguar D-Type of Hawthorn / Bueb (Mike Hawthorn at the wheel; they would win this race) and the # 4 Ferrari 121 LM of Castellotti & Marzotto who are in the process of overtaking the # 34 Bristol 450C of Wilson & Mayers. 1955 was of course the year of the biggest catastrophe ever at Le Mans and following the accident of Pierre Levegh, all Mercedes cars were withdrawn from the race. The race was won by Mike Hawthorn and Ivor Bueb in their Jaguar D-Type (S/N XKD505) with a total of 307 laps to their name. For the full results of this race, please see 24 Heures du Mans results 1955.